Kahlil Gibran's The Prophet offers splendid animation and occasional pearls of wisdom, wrapped in a vexingly dreary narrative made much less tolerable by its erratic tone. Your patience for the adaptation will likely depend on whether you find the titular poet profound or pretentious. Animation is traditionally considered a tyke-targeted genre, but films like Kahlil Gibran’s The Prophet, an uneven but unassailably ambitious adaptation of the Lebanese author’s classic prose poetry collection, challenge that perception. After all, it’s hard to imagine that the children who would be enraptured by the movie’s often gorgeous visuals would find themselves equally stimulated by its dense meditations on life, death, love and the ties that bind us to the natural world. Maybe that’s short-changing the more astute young’uns out there, but there’s no denying that The Prophet, with its steadfast devotion to Gibran’s verse, is layered in the extreme. Further blurring the intended audience for this take on the book is how it constructs a treacly Disney story within which to communicate the poet’s eloquent musings. 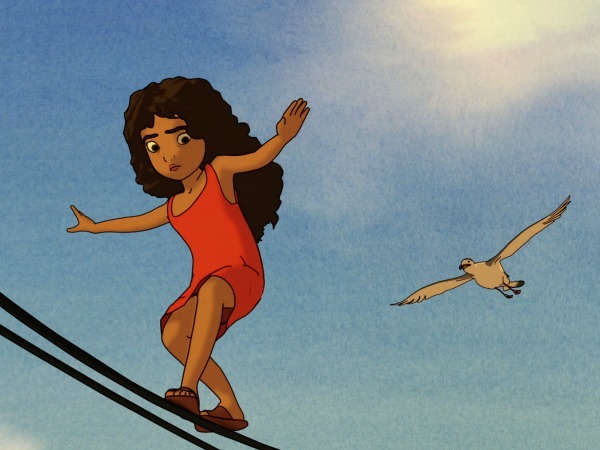 Salma Hayek, as performer and producer, seems to have coaxed The Prophet – oft considered one of literature’s many unfilmable works – to cinematic life, enlisting The Lion King director Roger Allers to pull a family-friendly plot out of a book that had none, and the strain is evident. The two are clearly big Gibran fans, but they come across as suffocatingly earnest in their desire to make viewers grasp the profundity of the author’s work, and parceling it with a wealth of one-note characters doesn’t help matters. The Prophet‘s main plot follows a poet named Mustafa (voiced by Liam Neeson, whose already lyrical Irish brogue helps the denser material go down smooth) who has spent seven years under lock and key after being accused of sedition by state officials who fear the power his words possess. Told he’s finally free to return to his homeland, Mustafa is escorted from his dwelling by a suspiciously amused security guard down to the docks, where he’ll board a ship and sail off into the horizon. Even Almitra, the rebellious little girl awed by Mustafa’s powers of perception (she’s mostly mute but occasionally voiced by Quvenzhané Wallis) can sense that something’s not quite right about the poet’s sudden liberation. Nevertheless, Mustafa makes the most of the walk down from his mountain-top cabin to the ocean. Every time he passes by something that spurs him to deep thought, from a joyous wedding to an impromptu feast thrown together in honor of his passage, the prophet launches into an elegant allegory. This, and the messianic clout he has with the locals, has the unanticipated side effect of making him supremely annoying as a character, given how abruptly the plot grinds to a halt when he latches onto some grand idea. Even Neeson’s sturdy vocals can’t keep him tolerable throughout. Regardless, when Mustafa goes off on one of his many poetic parables, the tangent is brought to life by one of eight different animators, all with styles that differ from one another, some wildly. It’s a strategy reminiscent of Disney’s Fantasia, and as in that pic, there’s a mixture of notes the segments hit, some false, others true. Taken as a whole, the vignettes are visually breathtaking, and they’re far and away the only pressing reason to check out The Prophet. Hayek, Allers and company have done solid work in tweaking Gibran’s poetry so it makes grammatical sense coming out of Neeson’s mouth, and the images themselves are absolutely marvelous. Tom Moore’s segment on “Love” is a particularly dazzling work of fluid Art Nouveau motion, while clay-painting genius Joan Gratz delivers one of the film’s most indelible sequences in her “On Work” vignette. There’s nary a weak link in the bunch, though some – especially Joann Sfar’s “Marriage” – don’t quite succeed in communicating the passion and vitality of the words accompanying them. The Prophet also offers some musical interpretation of Gibran’s poetry, though these are more hit-and-miss than the animations. A few of them are agonizingly mawkish and out of place with the ambitious, high-flying visuals, while others blend nicely with what’s on screen to impart the beauty of a given sequence. The same can’t be said of the overbearing score by Gabriel Yared, which sends the whole picture lurching more toward the toothless, Disney side of things. In the end, The Prophet just about works as a way to introduce younger audiences to Gibran’s poetry. It’s a very diverting affair, visually speaking, though the narrative can’t hide its threadbare, contrived nature for long, especially as the movie enters its misjudged finale (parents will have some uncomfortable questions about censorship and oppression in light of the film’s very upsetting conclusion). Moreover, the movie never escapes the sense that it’s a passion project possessing far greater meaning to its already-converted shepherds than anyone who could ever walk into it blindly. Where The Prophet really falters is in its insistence on bluntly hammering home the life-affirming nature of poetry that a considerable few already found portentous on the page. Unless you’re already enamored of Gibran’s grandiloquent writing, this adaptation may best be viewed at a low volume with a remote at the ready to pause and peruse the more stunning images – or, better yet, in its inevitable coffee-table-book format.